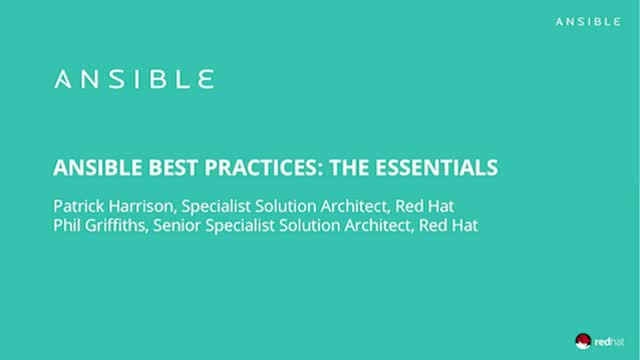 Whether you're completely new, just on your way or far down the path of using Ansible, our essentials talk is a great place to start the day and covers best practice mined from Ansible experts. Understand the basics and hear the advice seasoned professionals would have wanted to know when they first started. Finale Q&A Session from Ansible Automates London. Watch whilst your peers put their most pressing questions to our panel of experts from the Ansible Automates London event. As you introduce Ansible into your organization there are additional requirements needed to ensure you are running Ansible ‘Enterprise Grade’ to it's optimum. This session is a live demo of some of the key use cases for Ansible in the Enterprise, and you will get to see Ansible Tower with a specific focus on Application Lifecycle Management. While Ansible was born in the Linux world, did you know that Windows is a first-class citizen in the Ansible Ecosystem? Learn how you can automate common tasks against Windows O/S to help you take automation across more of your IT estate. Having the best tool is only part of the solution - it's how you use it that elevates your success. At Red Hat we see many customers implement our products and we see what helps them excel with Automation. Join us as we share some of the simple tips and approaches that help to instill the culture of automation and take your successes to the next level. But don't just take our word for it, one of our customers is here to explain how they approached this challenge and answer some of your questions along the way. In IT, Security is everyone's responsibility. Automation enables all engineers or developers to incorporate security best practice into their workflow. Ansible makes it simple for different teams from different domains to collaborate so that anyone can contribute to the combined capability of IT. Automating with Ansible lets you proactively and collaboratively tackle operational security tasks. Let us show you how the security "overhead" can become part of everyday best practice. Very few resources can be provisioned without some form of network interaction, and Ansible is fast becoming the de facto standard for network automation. What started as a 'nice idea' due to Ansible's agentless architecture has now become a full community including nearly all of the major network hardware suppliers. Automation of network devices, physical and virtual, requires the same skillsets as that of servers. If you work with networks, or with network teams, Ansible can bring automation to the network domain and allow you to evolve your network operations beyond manual tasks. The pace of IT change is increasing and the environments we have to manage are becoming more complex. Hear how Ansible has grown to encompass an increasing portion of your IT estate so that Automation becomes the empowering skillset for IT organisations to power business change, how we are making that easier for our users and how Red Hat can help you on that journey. IDC conducted a European study to assess how enterprise IT management and automation strategies are evolving due to the impact of cloud computing, DevOps, and digital transformation initiatives. This webinar highlights the key findings from this study and discusses how your European peers are breaking the shackles of cultural, technological and process hurdles to progress to DevOps in order to give themselves a competitive advantage. Tune in with experts from Red Hat and IDC to learn key strategies and takeaways to stay ahead of the curve in 2019 and beyond.